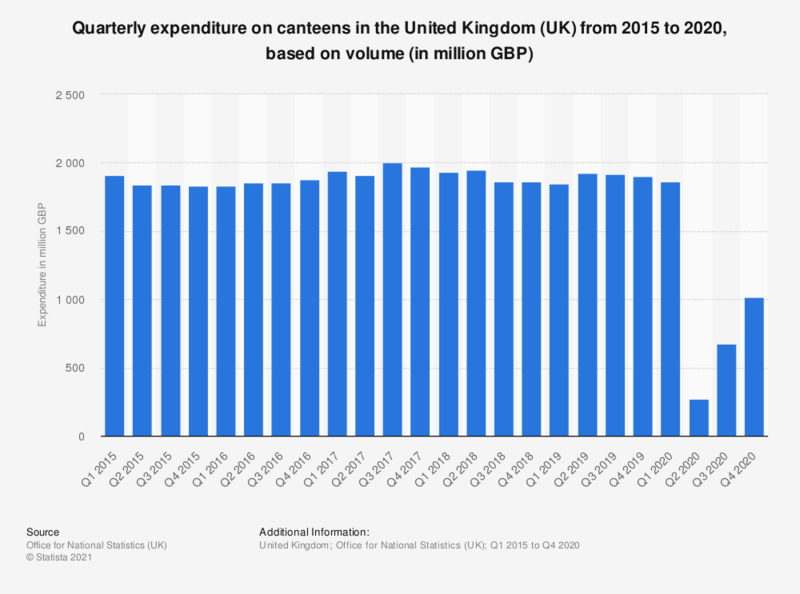 This statistic displays quarterly expenditure on canteens in the United Kingdom from the first quarter 2014 to the fourth quarter of 2018, based on volume. Spending amounted to almost 1.95 billion British pounds in the fourth quarter of 2018, compared to 1.93 billion British pounds a year earlier. Statistics on "Restaurant industry in Denmark"
What was the reason for you to eat out last time? What is your favorite type of restaurant? How often do you eat at pizzerias, burger bars, shawarma bars etc.? Which of the following describes best the canteen you're going to? Do you agree that you would typically choose an organic restaurant if the choice was between organic or conventional? For which of the following food categories do you think restaurants should increase the organic food share? Which of the following labels for restaurants do you know?